I accidentally deleted my photos from my laptop computer. Can I recover them from my hard drive or are the photos gone forever? Don’t panic! Yes, your photos can definitely be recovered from the computer hard drive and in fact isn’t gone forever. Accidental deletion of data and files, while immensely annoying, is more often than not a straightforward problem for our data recovery engineers to resolve. If you’ve by accident deleted photos or files, chances are good that they’re still on your laptop and can be recovered. We get enquiries of this kind of data loss on an every day basis and as a result we provide an extensive range of hard drive data retrieval services using advanced recovery software and hardware for laptop, desktop and external hard drives that were subjected to accidental deletion of files. My laptop hard drive has started making loud grinding or rattling sound intermittently but it still seems to work and I am able to access my files and data; should I get the hard drive checked out? Even though your laptop is still operating normally and you can access your hard drive data, if it is repeatedly making strange scratching, grinding, clicking or rattling noises, it could well be an indication of an abnormal function, hardware failure [head crash], motor failure or other mechanical defect with the notebook hard drive. It is advisable to immediately turn the computer off. For more information about hard drive failure and data recovery, get in touch with our experts for a free data recovery consultation and quote. 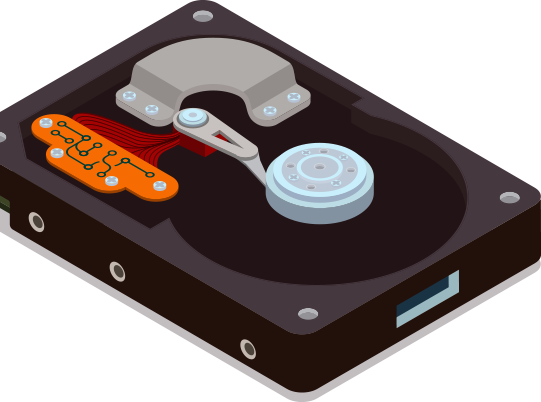 What is the charge of data recovery from a hard drive? The complexity of hard drive malfunction differs in each case. Creative IT offers a free, full evaluation of your corrupted or damaged drive to identify the extent of the problem – whether it is physical or logical. Once the evaluation process is complete, we provide a quick, precise, and affordable quote that covers all the details. What is the turnaround time for data recovery service? Creative IT strives to provide you the fastest turnaround time for all types of data recovery services. Our standard recovery time varies between 2 – 4 business days. However, this differs based on the complexity of problems encountered. For those who desire to avail our emergency data recovery services, the average turnaround time is within 24 hours.